Rush Hour's crucial reissue and reappraisal series of Trax cuts focusses on Jamie Principle and Ace & Sandman for their third installment. Firstly, we should state that each and every one of these tracks is a winner. 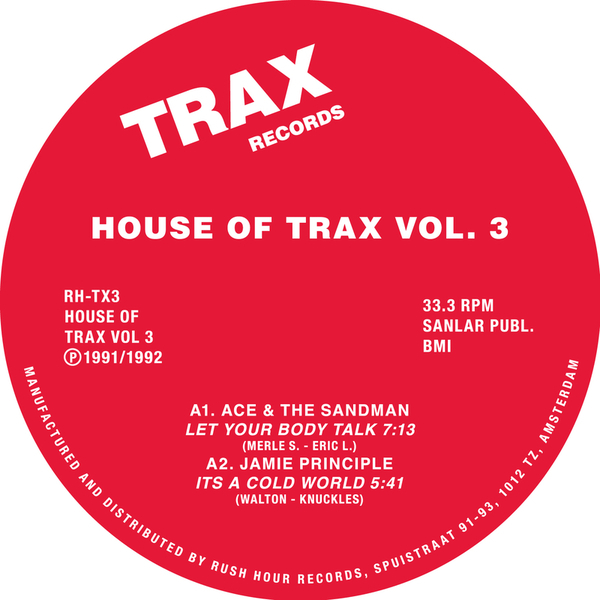 The Ace & Sandman cut 'Let Your Body Talk' is a lesser known synthy acid rub from the guys behind Virgo, all angelic chords, burbling 303s and demanding percussion. Next, Jamie melts our heads with 'It's A Cold World', just feel the shiver when that vocal hits! On the flip we get two mixes of his signature killer 'Bad Boy'; a a dark 'n sinister and previously unreleased version (that sounds a lot like that Ron Hardy black label a few months back), and the pacier original to get the shoulders pumping. Breathtaking stuff.